but had also many many disappointments. 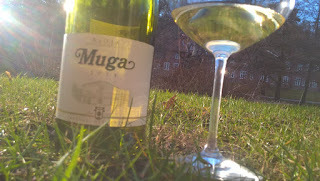 As going out side of my comfort zone in white wines seems to be my theme at the moment, why not give Spain a change. Silky smooth on the palate but, with a strong underlying structure and minerality. Starts actually really kind of shy, but like a diesel motor slowly starts to roll, and finishes with substantial power; leaving a beautifully lingering aftertaste of candied orange peel, lemon, and some spicyness.